Hair grooming has no gender; it applies to both male and females alike. When we all come of age, hair grooming becomes paramount. The good-looking beard, neatly cut hair to the clean-shaven legs, this all falls under good grooming habits. However, when we scale up to this level of electric shavers many people do not actually know how to go it. Matters get a little blurry in matters to do with the choice of which shaver to pick, how to use it and even maintain. However, in this article, I am going to be tackling about electric shavers and to be a little more specific, we will delve deeper to the best budget electric shavers you can have and till serve the purpose right. So, get pull in your seat as I take you through a list of the five best budget electric shavers I came up throughout my research in a quest to find the ultimate machine at the fairest price. Product HighlightsThe electric shaver comes with an ergonomic design that conveniently fits into your palm for a comfortable time during shaving. In addition, a wet and dry washable men’s electric shaver allows for use in both wet and dry conditions. For those who get quite a reaction shaving dry can use shaving cream and go ahead to rinse the blades in water for a comfortable and less irritating shave. It gives the best of both worlds in the electric shaving machines. Other innovative features geared towards a better shaving experience include the use of three blades placed in a 30-degree angle giving the best for increased accuracy and precision during a shave. With better coverage and closeness to the skin allows the shaver to shave off the even the subtle hairs trying to grow back for the cleanest shave possible. It also comes with a pivoted head that can easily adjust to the contours of the body to allow the machine to reach areas the fixed machines cannot. This also allows for fluidity as the machine follows the contour as the hand moves straight. You do not need a hand while using the Panasonic shaver. To make it even more effective, it comes with three multi-arc blades, which can move independently of each other for good skin contouring and have a Nanotech blade technology that keeps the sharp for over many shaves. Being a cordless machine also allows you to shave virtually anywhere you can find a mirror. No need of a power out socket, length of the cord or worry where the cord passes while shaving. You get a tangle-free shaving convenience. 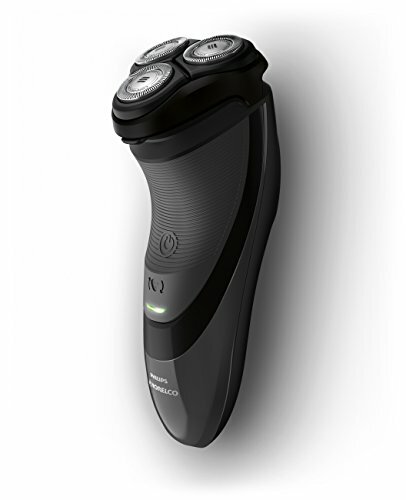 The electric motor fitted in the Panasonic ES8103S men’s that turns the blades at a quick speed of up to 13,000 cycles per minute for a quick cut of the hairs which eliminates the pull effect of a slower moving blade. This reduces the skin irritation, which could be quite uncomfortable afterward. 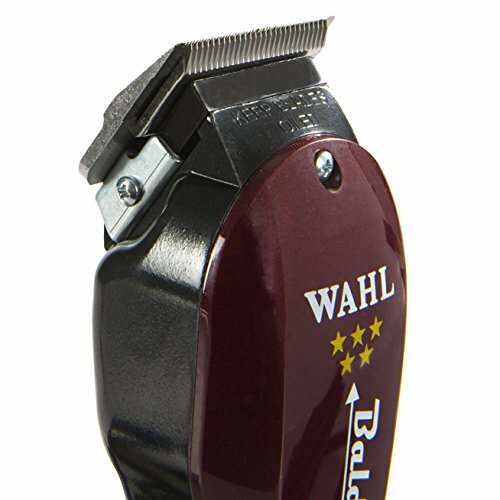 It also has a pop-up trimmer that is ideal for trimming straight edge hairs such as the sideburns or mustaches. When done, you can retract it into its flat position for use of the rotary shaving blades again. You get two machines in one. It also features an LCD screen that acts as an information center to keep track of battery charge, a cleaning reminder and a sonic vibration when in cleaning modeThe electric shaver also comes with a travel pouch to store and convenient enough to carry it while traveling. The machine also has an AC charger that is used to charge the battery in the machine. Its replacement blades are also available in the market when the current blade gets dull, you can order a new set and the machine is as good as new again. Can only run using the battery where others can run both cordless and when plugged into power. 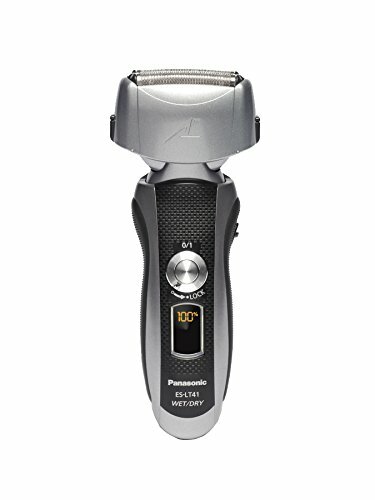 The Panasonic Arc3 is a dual electric shaver that can be used for both dry and wet shaving. The machine being waterproof allows for use even in the bathroom while having a shower, which I the ideal moment to do a wet shave. It also features three Nanotech blades razors that have a high retention of sharp edges even over prolonged use to give a cleaner and less irritating cut for the hair. The ultra-thin Multi-Fit Arc 3 foil blades are angled at 30 degrees position from each other and can move independently apart from being pivoted that the end of the machine for a better movement upon the skin contours while shaving. This allows for a smoother and a closer shave. The ES-LT41-K is fitted with a fast and efficient motor that can attain an impressive 13,000 cycles per minute in linear motion, which allows for a smooth cutting of the hairs without tugging them, as it would be for slower machines. This reduces the skin irritation after the shave. The machine also comes with a self-cleaning option where it uses sonic vibrations under running water to rinse off any hairs or dirt that could have been stuck. It also features a side pop up liner trimmer ideal for trimming sideburns or mustaches that need attention to details. It also has an LED screen that displays the battery status and a cleaning reminder when it is due. The shaver also has a quick charging battery and can be fully charged in an hours’ time, which is convenient especially when traveling. Upon purchase, it comes with an AC travel adapter for charging and a storage pouch. Feature three Nanotech blades razors that give a clean haircut and does not pull on hair thus any skin irritation. The Braun Series 3 3040s ProSkin comes in an innovative design that is comfortable to use while shaving and also allows one to reach out to the difficult and angled areas such as under the nose and under the chin.It also comes with a MicroComb technology that is positioned in between the two rotary blades that help catch the hair on the first stroke and feeds more hair to the blades for a better shave.It also employs the use of triple blade cutting action using the two rotary SensoFoil and the middle trimmer to give a cleaner shave. Subtle hairs that are merely emergent have no place to hide on the skin they are shaved right off.The machine can be used for both dry and wet shaves, as it is waterproof. Be it using the foam or gel or in a shower, you can comfortably use the shaver with no worry.It also uses two powerful rechargeable Ni-MH batteries that are quick charged within an hour and can last for forty-five minutes in use under a full charge. The led display helps indicate the battery level during charging and us too.The cordless electric shaver brings about convenience as you can shave virtually anywhere with no hassle if trying to entangle the cords like the corded shavers.It also has a precision trimmer mounted on the back that can be pushed out when needed to trim facial hair or trim long hair before proper to clean shaving.It comes with a storage pouch and a travel adapter for recharging when the battery is down. Affordable grooming with the Philips Norelco Electric Shaver 3100, S3310/81Product HighlightsThe Philips Norelco Electric Shaver 3100 comes in an ergonomic design that is both comfortable to the hand and makes it easy to use while shaving.The shaver features three circular Comfort Cut Blade System that has rounded edges that helps them glide smoothly over the skin with the least irritation to the skin. The blades move in four directions that effectively trace the face contour to give a clean shave even for the angled areas such as near the nose or the neck and the chin.The machine can be used with both a cord or as cordless, once its rechargeable battery has been fully charged. The shaver uses a high Lithium-ion power battery that can last you more than just a single shave. You do not have to entirely rely on your battery to shave.The power status is displayed on the machine through a lighting LED. 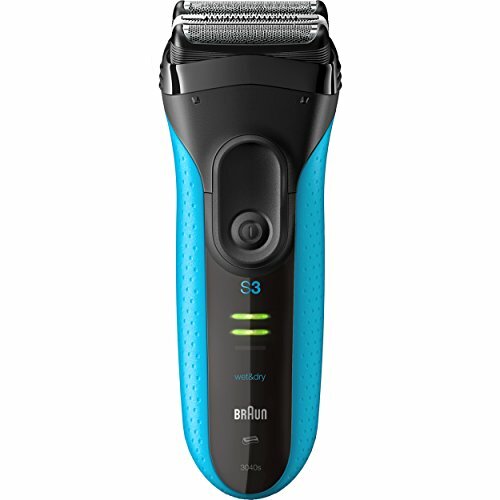 It tells the user when it is low on battery, charging or when it has been switched one.The blades head can also be popped open through a button click to allow for rinsing of the three blades through the running water without getting any to the motor.It also features a pop-up trimmer that can be used to cut shot long hairs before shaving of trim facial in precise lines or curves such as the sideburns or shaping the mustaches. Does not come with a storage pouch upon buying one. It is bought separately. Product Highlights: The Remington F5-5800 Foil Shaver is a bundle of both convenience and safety in one package. It features an ergonomically design that is comfortable to hold while using and easy to operate too.The shaver can also run under cordless or corded depending on the situation. It comes with a long power cord that is also used to charge the battery when the cordless operations are mandated, such as include when out traveling. It allows one to enjoy the full benefits of a cordless machine such as flexibility as it has a five-minute quick charge that can last up until the entire shaving session.An LED strip helps indicate the battery level and show when the shaver is charging too through different colored diodes lights.It also features a pivot and flexes shaving head that allows for fluid flow over the skin while shaving near the chin neck and jawline too. This gives better contact with the skin for a cleaner shave.Using the intercept Shaving Technology with the blades situated at the center of trimmer direct the hair to the other blades and get a closer cut too to shave even the small subtle hairs that have been left by the other rotary blades.On a full two-hour charge, it can run for up to twenty days shavings before recharging again.The shaver is also waterproof which allows for easy cleaning as you can rinse it off in running water and dry it quickly without the need to worry about the electrical parts being affected. This allows for use of the shaver for both dry and wet shaves too.With a pop-up trimmer, it gives the shaver versatility as it can be used to carry out precision trims such as those on facial hair as well as shave other hairs too. Does not come with the pouch upon purchase. The pouch is bought separately. Product Highlights: The Philips Norelco Electric Shaver 2100 is a rotary shaver that brings in shaving affordability to another level.A lightweight and portable machine incorporate an ergonomic design that is both comfortable and easy for us. You barely need a helping hand while shaving even the delicate areas.It employs an innovative self-sharpening blades design that keeps the blades sharp for a comfortable and close dry shave even for the sensitive skins.It features three rotary heads that flex in four directions, which allows for easy contouring as it moves over the skin in hard to reach such as the chin and near the nose.It is also easy to clean as the head can be clicked open with a press of a button and rinsed through running water before drying. This makes it easy cleaning an after every use. The shaver’s rechargeable lithium-ion power battery that can last up to thirty-five minutes in one full charge powers it. It also has a LED indicator that gives information about the power status of the machine to the user. Upon purchase, it comes with a power charging cord. Can be used for both dry and wet shaves. Features a pop-up precision trimmer making it a two in one machine. Has an innovative self-sharpening mechanism that always keeps the blades harp. Has a power status indicator LED to ensure you always in the know. It is small, lightweight and portable. What do you need to look for in a good Affordable electric shaver? Dry and wet shave machine: An ideal electric shaver should be capable of handling a wet shave as well as the dry shave. This gives more options and usability for the machine since both that have sensitive skin can still use the shaver comfortable without damaging it. Maintenance: A good machine should be easy to clean up after each use. The shaver should either self-clean or have a quick release mechanism to permit the cleaning quickly and easily too. Poor cleaning on such instruments could lead to a build-up of dirt, and bacteria that may infect otherwise broken skin during shaving which would spell more danger to an otherwise good skin. Power options: Electric shavers either can run on batteries or be plugged in directly to the power socket. However, the combination of both gives the best of both worlds. This allows one to use the shaver if there is no power and consequently use the machine whilst charging if the battery is low. Blade arrangement: Each manufacturer has come up with their innovative blade technology or setting that they promise to deliver the best results. However, this is blind hope that it works as good as they say it does. To get a better picture, you can look around at other people’s feedback on the particular technology and pick the one with the best reputation. Why be the genuine pig and risk your hard earned money while others can help point you in the right direction on what to buy. Versatility: A good machine should be able to combine the benefits of a rotary shaver’s abilities and foil shaves in the same machine for multiple uses. A rotary shaver should have a pop-up foil shave that can be used to shave and shape delicate facial hair altogether. You should get a machine that offers both the benefits of one package to avoid buying another separate shaver, which could be costly and tedious too. The difference between rotary and foil shavers? The rotary shaves use a curved-perforated outer casing that forms a stationary guard while a blade that rotates on the inside. This creates a scissor effect that cuts the hairs that pass through the station guard. A foil shaver employs the use of two flat teethed blades where one of the blades moves relative to the other cutting any hair that passes through the teeth. How often should I replace electric razor blades? This depends on the manufacturer and the rate of use of the shaver. The more you out the more you bound to change the blades, as they get dull quicker. What features should I look for in an electric shaver? We discussed the point above, however, some factors include functionality, whether wet or dry shaving, size depending on use, ease of cleaning just to mention a few are important factors. Are electric shavers less sensitive? The answer is a definite yes. This is because the electric shaves do not scratch on the skin as much as the manual blade would thus give a better result as much as skin irritation is concerned. • You get similar benefits to someone who invested heavily in a shaver since they do the same job. You always do not have to dig deep into your pockets compared to someone getting the top brand shaver. You end up saving some cash. With proper maintenance, the inexpensive shave might outlast a quality shave that is not well maintained. It is all about maintenance. The quality of shave will definitely show in the end. An expensive machine will do a better job compared to the inexpensive machine. The shave does not last as much as an expensive and quality shaver would. Therefore buying a cheaper one would be more of a temporary fix than solving the problem long term thus not a money saving venture. An inexpensive shaver may not be as good as an expensive one in design and performance thus may be a little harsher on the sensitive skin than the good quality and expensive shaver. How to get the most out of inexpensive electric shaver? There’s a Ying and a yang towards owning an inexpensive electric shaver as discussed above. However, overlooking the bad that comes with the inexpensive machines, below are some of the things you could do to get the best of whatever you have at hand. Proper cleaning: It is understood that a machine is a good as it cleaned. Therefore, with proper and thorough routine to clean the machine after each use, you can be sure to get the best of it for the longest haul possible with the least of issues arising. Always disinfect to kill any bacteria’s and dry well after cleaning to avoid corrosion if there are metal parts exposed. Proper maintenance: This majorly focuses on the razor blades change. It is important to change the blades as soon as you fell they pulling your hair or after the recommended time by the manufacturer. You can opt for better and more expensive blades with an aim to get the best cur from a cheap shaver too. New brooms sweep clean, so do new blades cut well. The race to picking one electric shaver has been a close one as all the shavers on the list have their main features that may appear similar and both are within the same budget range. Nevertheless, there has to be a winner. Their innovative pivot flex technology that allows for an easy and close shave of hard to reach body areas such as the nose, cheeks and the jawline. It also uses surgical steel blades for shaving the hair giving a better and cleaner cut than the other models too. A three arc multi-blade technology that gives a cleaner cut whilst being tender to the skin too. It also comes with an LED screen that gives the shave status as it works. However, this is not the nail on the coffin. Depending what catches your eye, the products listed on this list passed my rigorous test and I would recommend any of them to anyone.